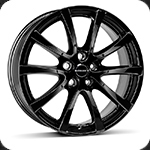 The LV5 wheel in the "Premium" category is an elegant, dynamic 10-spoke wheel. The sweeping lines of the spokes and the staggered connections to the wheel rim create a high quality, elegant appearance. The LV5 wheel is available as a 5-hole wheel in the color "black glossy".